HJ: We cannot expect mainstream media to cover stories such as these, as they present information that flies in the face of the illusion that the multinational corporations and various secret power structures continually reinforce in the interest of seeking to withhold potentially liberating truth from the masses. They cannot maintain their stranglehold on energy/electricity, the lifeblood of modern society, if abundant, cheap, unregulate-able sources of alternative energy exist. Therefore they engage in an extensive scheme of cover-up, intimidation, disinformation and sabotage in order to quell any potential challenges to their power structure. However, the internet is changing all that quite rapidly. Information flows more freely than it ever has and it is getting harder to maintain control over sensitive information such as this. For that reason, though, disinformation is at an all-time high and leads many to become trapped in the paranoid/conspiracy realm as they struggle to find truth within themselves and simultaneously have it unquestionably validated in the external world. To venture into this area of information without a strong spiritual conviction is dangerous, as it can easily lead one to thought patterns and beliefs that can be hard to untangle once created and reinforced. That being said, a healthy, critical mind is you best asset. Couple that with strong spiritual discipline and understanding and one can safely traverse the areas of secrets, conspiracies, cover-ups and so on unscathed and intact. A monumental discovery with four years of comprehensive geo-archaeological research has failed to reach mainstream audiences for some reason. The most active pyramid site in the world dating the pyramid complex back 25,000 years has also released scientific evidence supporting the theory that the pyramids were used as an energy source. The recent study reveals energy beams transmitting electromagnetic signals unexplainable by our science in what is now documented as the largest Pyramid complex in the world. Overwhelming evidence, supported by scientific research from all over the archeological community proves that our recorded history is wrong concerning ancient cultures which in turn changes religion, science and academics. The very first thing world powers do when their control systems are threatened (and they can’t elimate the idea) is they create a misinformation system to make people believe that powerful new or ancient technologies are a hoax. Prominent archaeologists have attempted smear campaigns on Dr. Osmanagich’s work out of fear of how the impact of his discoveries will make on their own work. Examples of the main pyramidal complexes worldwide show that under the pyramids, underground passageways and chambers had been built. 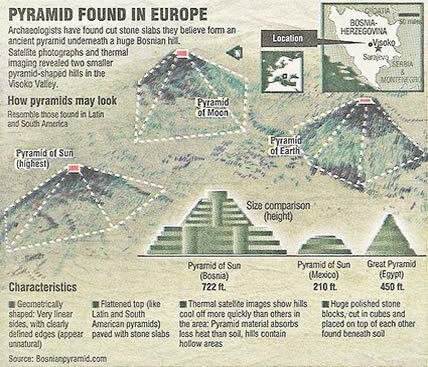 It’s the case of pyramids in Giza (tunnels connect the pyramids, sphinx, Nile), Teotihuacan (underground enlarged 4-chamber cave with passageways), Step pyramid in Saqqara (underground “labyrinth”), China (underground tunnels built from sandstone, bricks and clay), Tenerife (cave-tunnels in Guimar). 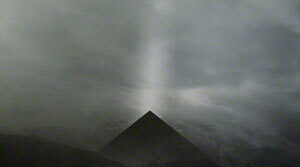 Numerous field findings suggest that an extensive tunnel network exists in the Bosnian Valley of the Pyramids. It is hypothesized (Principal investigator Semir Sam Osmanagich) that the tunnel system connects all of the colossal objects, water wells and other structures of importance. The current excavations in progress have already presented with findings of several shaped monoliths in the tunnels. Hundreds of meters of tunnels have been secured by wooden support. The tunnels were definitively not the mining shafts as no tools, coal, silver, gold or any other worthy material werefound and they appear much older than Middle Age or Roman times.